We were honoured and excited to see Willam Fox Pitt training some of his young horses here with us. 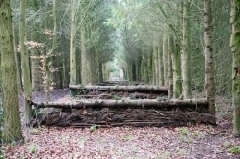 Our jumping lane through the woods and cross country course are ideal for youngsters and a pre season run out! So don’t delay in coming to visit us. Model almost came a cropper! We did have a giggle the other day, when our photoshoot stars Bryan Elliott and Bugsy almost came a cropper at the water. 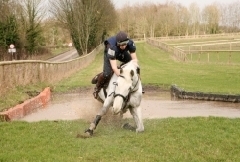 Bugsy – more of a showjumper these days due to his notoriously bad form at water whilst eventing, nearly had Bryan off whilst doing the photo shoot for the new website. Bryan was seen hanging on round Bugsys neck as he cantered on as if nothing had happened! Compusure was regained and the photoshoot thankfully continued with no more mishaps!